This past weekend I got a treat I honestly didn't think I would see: my grandparents (mom's side) made a weekend trip up from Atlanta, Georgia to Chicago to get a slice of my new life up here. C.R. 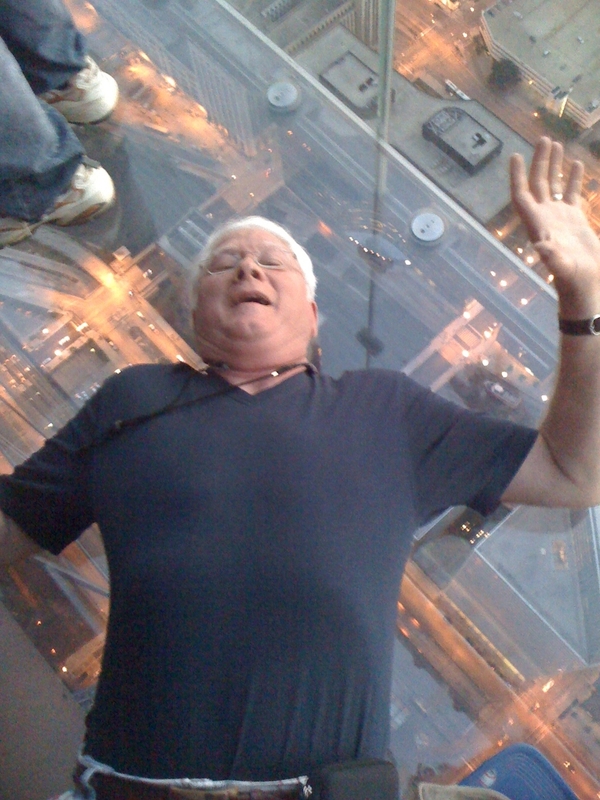 and Jackie CR laying down on the glass floor of the SkyDeck(yes, I refer to my grandparents by their real names....it's odd I know but get used to it) visited C.R's brother up in Michigan and decided "Hey, we're already this close, might as well swing through Chicago." So not only did they get to experience a new city (to them) but also had the opportunity to travel via Amtrak for the first time too. My mom had given them a heads up that things were fast paced up here and I think any underestimating they may have done in regards to that fact were squelched the first ten minutes here. They arrived into Union Station on a Friday during rush hour. Not only does Union Station serve as a boarding station for Amtrak trains but also houses Metra commuter trains for all of the suburbanites. So not only were copious amounts of tourists making their way through the station but also all the commuters wanting to get home for the weekend. My grandparents stepped off the train into a sea of people rushing every which way. The next challenge: getting them to their hotel. This is where they got broken into the pace of the city. We had the option of taking a cab to their hotel or taking one of the buses. Knowing it was rush hour I asked my grandmother how clausterphobic she was (referring to the bus). CR made an executive decision to pay for a cab and have a car to ourselves. Catching the cab downtown in the middle of rush hour was a difficult task and one where you had to be quick on your feet. Once we got into one (after I was swindled $6 from a guy who had a "service" of hailing cabs) the ride was CRAZY. It was seriously one of the more intense cab rides I had ever been on...and I've been in many. After re-living a level of the old game "Crazy Taxi," Jackie responded with "I think I'm over my clausterphobia now." After that the weekend was more evenly paced. We got to skim the surface of the city fairly efficiently by spending the Friday evening seeing Tall Ships at Navy Pier, then spent all day Saturday touring the city on a double decker bus tour. Sunday night capped off the weekend with a trip up to the SkyDeck of the Sears Tower. Yes, I'm still refusing to call it the Willis Tower. It was a great weekend! This Labor Day weekend? Round two with my parents coming in Saturday afternoon. Should be another good one!